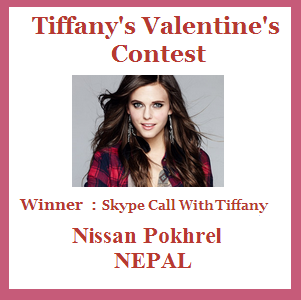 +View Your Choice- तपाईको सोचाई हाम्रो रोजाई - does a special interview with +Nissan Pokhrel winner of +tiffany alvord Valentine Day contest who speaks to +Tiffany Alvord as being winner. Nissan Pokhrel has been following music as well as cinema and has been avid fan of celebrities including +Priyanka Chopra and +Shah Rukh Khan while also a lot celebrities from Nepal as well internationally. Also, here is the video where +Tiffany Alvord announces the winners.